Heat coals or gas grill for direct heat. Spread butter on 1 side of 2 slices of bread. Place 1 slice, butter side out, on sandwich press. Spoon 2 tablespoons of the pizza sauce onto center of bread. Sprinkle with 1/2 cup of the cheese; top with 3 slices of the salami. Top with other bread slice, butter side out. Close press; trim excess bread if necessary. Grill over campfire or on grill 4 to 6 inches from medium heat 8 to 10 minutes, turning once, until bread is golden brown and cheese is melted. Repeat with remaining ingredients. 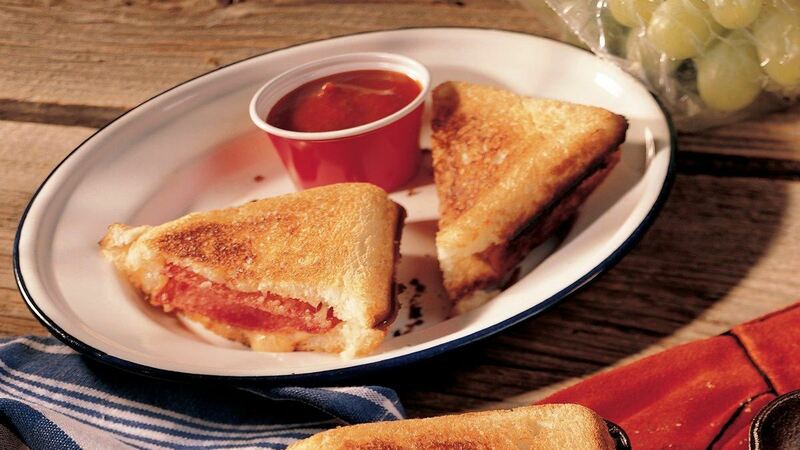 Serve warm with additional pizza sauce.